© David Lyman; Licensee Bentham Open. Spontaneous esophageal perforation is a rare and life-threatening disorder. Failure to diagnosis within the first 24-48 hours of presentation portends a poor prognosis. A patient with mixed connective tissue disease (MCTD) on low-dose prednisone and methotrexate presented moribund with chest and shoulder pain, a left hydropneumothorax, progressive respiratory failure and shock. Initial management focussed on presumed community acquired pneumonia (CAP) in a patient on immunosuppressants. Bilateral yeast empyemas were treated and attributed to immunosuppression. On day 26, the patient developed mediastinitis, and the diagnosis of esophageal perforation was first considered. A review of the literature suggests that the diagnosis and management of spontaneous esophageal perforation could have been more timely and the outcome less catastrophic. Keywords: Esophageal perforation, spontaneous esophageal perforation, mixed connective tissue disease..
On 12 29 08, a 61-year-old family physician presented to the ED of his community hospital with a 12-hour history of left posterior shoulder pain. He had recently examined many children with viral URI symptoms and had experienced chills earlier that day. While waiting to be seen, he felt light headed, sat down and lapsed into a coma. Mixed connective tissue disease (MCTD) diagnosed in 2007 both clinically (swollen fingers, synovitis, myalgias, Raynaud’s phenomenon) and serologically (high-titer speckled ANA, positive anti-RNP, negative anti-SCL-70). Patient maintained on 10mg prednisone daily, 25mg SC methotrexate weekly and weekly leucovorin. A recent cardiac catheterization for suspected pulmonary hypertension was normal. Lumbar and thoracic spondylosis with degenerative arthritis of both acromioclavicular joints. Herpes Zoster (S1-S2 dermatome) in May 2008. Nissen fundoplication and sub-selective vagotomy in1992 for intractable esophageal reflux and recurrent GI bleed. Non-drinker, non-smoker, married for 35 years, 2 college-aged children. He had recently discontinued obstetrical care because the MCTD and Raynaud’s syndrome interfered with the use of his hands. As above, plus hydrocodone10mg/325mg APAP and ketoprofen for pain, tetracycline 500mg BID for scalp acne, and Diltiazem 360mg daily for Raynaud’s. He appeared in good health but was agitated, confused, diaphoretic, tachypneic, and on nasal oxygen (SaO2 of 99%). He was afebrile, pulse 100, normal BP. Decreased breath sounds in the lower left chest. No subcutaneous emphysema, no clubbing of digits, and no inflammatory arthritic changes. While in the emergency room, the patient received a total of 9mg hydromorphone IM/IV for refractory chest pain. ABG pH 7.24, pCO2 57, 02 saturation 95% on 6 LPM nasal oxygen. AP scout film (Fig. 1) was diagnostic. CTA (computed tomography arteriography) showed no PE, a small (15%) left pneumothorax, mild pulmonary edema, a small left pleural effusion, no airspace consolidation or aortic dissection. Giménez A, Franquet T, Erasmus JJ, Martínez S, Estrada P. Thoracic complications of esophageal disorders. Radiographics. 2002 Oct;22 Spec No:S247-58. (*An unrelated right pericardial fluid collection is also seen). The patient was transferred to a nearby tertiary care hospital with the diagnosis of community-acquired pneumonia (CAP) and altered mental status. Narcan was given upon admission with no improvement. Ceftriaxone, azithromycin, and stress-doses of hydrocortisone were administered. On day 2 (12/30/09), a second CT showed a complex left hydropneumothorax and LLL consolidation. He rapidly deteriorated and was intubated for acute respiratory failure, progressive encephalopathy and septic shock requiring pressors and drotrecogin alfa. Antibiotics were changed to vancomycin and levofloxacin. A thoracentesis revealed hyphae, and anidulafungin was added. Blood and sputum cultures were negative. Pleural fluid cultures grew out Candidaalbicans only. The differential diagnosis was fungal versus CAP with empyema, septic shock, and multisystem organ failure (MSOF) including renal failure, encephalopathy, and acute respiratory failure. On day 11 (1/8/09), a left thoracotomy with decortication removed an extensive empyema peel. The surgeon described immediate reexpansion of viable lung. Postoperatively, a new right pleural effusion developed. Diagnostic thoracentesis grew Candidaalbicans, Candidalusitaniae, Lactobacillus, and alpha hemolytic streptococcus. On day 19 (1/16/09), an EGD (esophagogastroduodenoscopy) for an UGI bleed revealed a small esophageal erosion with no ulceration or esophagitis and a benign gastric ulcer. Over the next week, the patient failed to improve despite aggressive tube thoracostomy drainage and multiple antimicrobials. On day 26 (1/23/09), the radiologist observed interval CT changes (Fig. 2) not present on 1/6/09 and barely visible on 1/15/09 - the day before the EGD. A diagnostic test was suggested and performed later that evening. What CT abnormality did the radiologist observe? What procedure or test would be diagnostic? 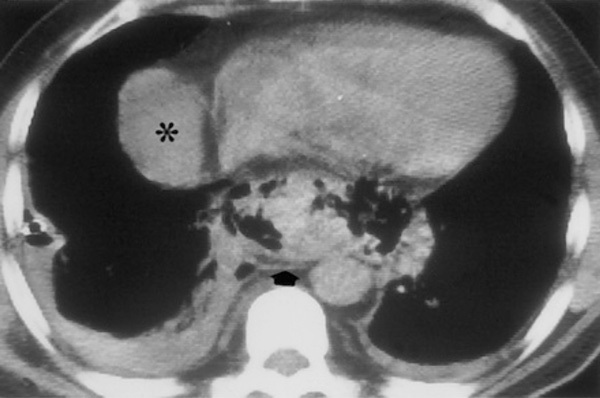 CT scan showed mediastinal gas (arrow) with bilateral pleural effusions. The evolving mediastinal process was consistent with an esophageal perforation, and the radiologist suggested a Gastrografin esophagram. A small outpouching was noted at the distal esophagus, and a limited chest CT confirmed the extravasation of barium into both left and right pleural spaces. Later that evening (day 26 of hospitalization), the patient underwent a right thoracotomy and decortication. Despite meticulous debridement of necrotic mediastinal debris, the esophageal perforation was never identified and biopsies for histology were not obtained. The suspected area was approximated with parietal pleura and intercostal muscle. The patient remained NPO, and spontaneous closure of the perforation was documented by serial esophageal CTs. One month later, the patient no longer required oxygen and was transferred to a rehabilitation facility for treatment of critical illness myopathy. Four months after presenting in septic shock, the patient was discharged home using a walker, receiving outpatient physical therapy, low-dose prednisone, and extended-release morphine for pain. At 2 years, arthritis pain with residual proximal muscle weakness and moderate-to-severe restrictive lung disease limit all activities. Definitive diagnosis is challenging. Because the majority of patients report pain somewhere in the thoracic region, a chest x-ray (CXR) or computed tomography (CT) of the chest is often ordered as the initial imaging modality. Abnormalities suggestive of perforation include a pleural effusion, pneumothorax, pneumomediastinum, or mediastinitis. These abnormalities may not appear for several hours - while the patient becomes increasingly unstable. Early Gastrografin esophagography may identify the perforation, although the results are falsely negative in 15% to 25% of studies. If clinical suspicion remains high, radiologists recommend helical CT esophagography to improve the sensitivity of contrast-enhanced esophageal radiography [3, 4]. The esophagus deviates to the left to enter the esophageal hiatus, placing the left lateral wall in direct contact with the mediastinal pleura. For this reason, 70% of pleural lesions present on the left. When the mediastinal parietal pleura are breached, a lefthydropneumothorax, pyopneumothorax, or empyema develops. Bilateral empyemas soon appear if the diagnosis of perforation is delayed . Empyema pH of <6.0 early in the course of an acute illness suggests an esophageal perforation. Although chronic, well-localized empyemas can occasionally have pH values of <6.0, such a level would not be expected to occur in newly formed lesions. The distinction is critical: mortality may approach 50% if treatment of esophageal perforation is delayed by 24 hours or more . Consensus on best treatment is limited by the heterogeneity of patients upon presentation. Some patients present in septic shock requiring intubation and inotropic support, while others present with minimal signs of sepsis. Reported mortality rates range from 10% to 50% regardless of the timing of surgical intervention. Nonetheless, most authors advise primary repair of the perforated thoracic esophagus if the diagnosis is confirmed within 24 hours of admission - with the caveat that survival and early intervention may have an inverse relationship. This observation has been termed selection bias: the patient with less contamination may tolerate a longer diagnostic delay than the patient who presents moribund but is rapidly diagnosed. Conversely, associated comorbidities (sepsis, respiratory failure, cardiac complications, empyema, renal failure) may contribute to the increased mortality observed when definitive treatment is delayed [2, 4, 6-8]. Aggressive non-operative management has been proposed as one treatment option, especially when the rupture has been contained by the mediastinal pleura [1, 4, 8]. Iatrogenic perforation during endoscopy may be best treated with either conservative or interventional (i.e., stent placement) therapy. Spontaneous rupture of the esophagus is associated with more extensive mediastinal/pleural contamination. These patients present with septic shock and MSOF, and are more likely to require surgery [1, 8]. However, there is no general agreement on treatment if the diagnosis is delayed and the patient is tolerating pleural/mediastinal drainage. Vogel, et al., observed that esophagocutaneous fistula via chest tube healed as well as other gastrointestinal fistulas - an enthusiasm not shared by most authors . Griffin, et al., observed that a delayed primary esophageal repair was more likely to leak, and suggested repair over a T-tube to create a controlled esophagocutaneous fistula . Conversely, Kiev, et al., and others note that surgical repair can be safely offered even when the diagnosis is delayed [2, 8]. In 2009, Vallböhmer, et al., published their experience with lower esophageal perforation, and reviewed the outcomes of 12 previous publications. The authors conclude that treatment of a lower esophageal perforation may be individualized depending on the etiology, location, and size of the perforation. A stable patient who presents with an iatrogenic perforation may be safely observed and offered the most appropriate treatment - conservative, interventional, or surgical. The patient who presents acutely ill with a spontaneous perforation and extensive mediastinal contamination is more likely to undergo aggressive surgical therapy. Surgery within 24 hours of diagnosis has an observed mortality rate of 14% compared to 27% when treatment is delayed for 24 hours or more. Perhaps the most critical issue is the timely elimination of a septic focus. The authors found no consensus on best treatment for the septic patient: aggressive pleural/mediastinal drainage with stenting or definitive surgical debridement with primary repair each have their advocates . Also in 2009, de Schipper et al., reviewed the literature from 1975 to 2008, and concluded that existing data was limited to either retrospective tertiary care center reviews or expert opinion with significant publication bias regardless of management - whether conservative, endoscopic, or operative. His group proposed the following algorithm for future prospective studies: operative treatment should be offered to the patient diagnosed with lower esophageal perforation within the first 24-48 hours; conservative treatment should be recommended if diagnosed after 48 hours, with conversion to operative treatment if the patient becomes septic. In the absence of extensive tissue necrosis, primary repair offers acceptable results with the shortest hospitalization. Resection and reconstruction may be necessary if the surgeon encounters extensive necrosis or distal obstruction. Diversion with proximal and distal esophageal exclusion may be the only option for the patient too ill to tolerate more extensive surgery . WHY WAS ESOPHAGEAL PERFORATION NOT DIAGNOSED FOR 26 DAYS IN THE CASE PRESENTED? The diagnosis of CAP is based on certain clinical features (e.g., cough, fever, sputum production, pleuritic chest pain) supported by imaging of the lung. Rarely, CAP may present with atypical radiologic findings: hydropneumothorax with pulmonary consolidation has been reported . However, neither the clinical presentation nor the initial radiologic findings suggested CAP, and were more consistent with the diagnosis of spontaneous esophageal perforation - a rare diagnosis not considered until much later [3-5]. Pleural effusion complicates up to 44% of patients with CAP, and 10% develop a complicated parapneumonic effusion or empyema . In the case presented, bilateral empyemas were aggressively treated, although the cause of the suspected pneumonia was never identified. This by itself is not alarming: the causative organism in CAP cannot be determined in 50% of cases . Rapid pleural fluid accumulation resulted in near-complete consolidation of the left lower lobe (LLL) within hours. By day 3, radiology was using the terms “consolidation,” “atelectasis” and “pneumonia” interchangeably. Contrast enhanced chest CT may help differentiate atelectasis from pneumonia . On day 10, chest CT with contrast was obtained, and the radiologist described “near-complete atelectasis of the LLL” with no bronchial obstruction and no lobar pneumonia. Infections account for more than 50% of ICU admissions for patients with systemic rheumatic disorders . The isolation of Candidaalbicans and Candidalusitaniae from pleural fluid was attributed to the patient’s use of prednisone (10mg PO daily) and methotrexate (25mg SC weekly) for mixed connective tissue disease. Candida pneumonia does occur in severely immunocompromised patients but is a difficult diagnosis to establish: Candida is a common colonizer in this patient population. However, CT findings presented were not compatible with Candida pneumonia - an infection that presents with multiple, bilateral pulmonary nodules and consolidation . Was the patient immunocompromised? Lisboa, et al., followed the hospital course of 457 patients admitted to the ICU with severe CAP. Patients were considered immunosuppressed only if they were receiving radiation therapy or chemotherapy, if they had HIV/AIDS, of if they received more than 20mg of prednisolone daily for at least 2 weeks . There are authors who suggest that the simultaneous use of corticosteroids and immunosuppressive drugs to treat certain connective tissue diseases may increase the risk for infection . Wolfe followed 16,788 rheumatoid patients who were assessed semiannually for 3.5 years. He observed a dose-dependent risk for being hospitalized with pneumonia in patients who received less than 20mg of prednisone daily: at a dose of 5-10mg/day, the hazard ratio (HR) is 2.1 [95% confidence interval 1.7-2.7]; at a dose over 10 mg/day, the HR is 2.3 [95% confidence interval 1.6-3.2] . The HR for infliximab, adalimumab, and methotrexate were not significantly different from zero . However, there are no large-scale studies that compare the use of immuno-suppressive drugs and the prevalence of infections in MCTD . Empyema most commonly develops after pneumonia (40% to 60% of cases) but is also caused by trauma, surgery, subdiaphragmatic infection, hematologic spread, rupture of an intrapulmonary abscess, and esophageal perforation [19, 20]. Mandell et al., in Consensus Guidelines on the Management of Community-Acquired Pneumonia in Adults, state that the failure of CAP to respond to appropriate treatment suggests either an impaired host response (i.e., immunosuppression) or an extrapulmonary process . The early isolation of two species of Candida (albicans and lusitaniae) from empyema fluid was aggressively treated, but attributed to either immunosuppression or contamination. In fact, the patient never had pneumonia: Candida empyema without pneumonia has been described as a complication of surgery, subdiaphragmatic infection, candida sepsis, and esophageal rupture . The search for esophageal perforation should have begun in earnest once the diagnosis of fungal pneumonia was dismissed. entrapment, and tube thoracostomy may no longer provide adequate pleural drainage. Open thoracotomy with empyema evacuation and pulmonary decortication is required to resect the empyema “peel” and release collapsed lung. Failure to diagnose esophageal perforation as the source of pleural/mediastinal soilage has disastrous consequences, as demonstrated by the rapid reaccumulation of empyema fluid on the right following decortication on the left lung [19, 21]. The vast majority of perforations are either traumatic (iatrogenic or barogenic), inflammatory, or neoplastic. True spontaneous perforations account for a small minority [5, 22]. GERD-related esophageal perforations are very rare but can cause mediastinitis and death . The patient had a history of GERD, but endoscopy was negative for erosive esophagitis. Esophageal dysmotility is common in MCTD, although esophageal perforation has never been reported. Among the spectrum of collagen vascular diseases, esophageal perforation has only been described as a rare complication of dermatomyositis and in Behcet’s disease with aphthous esophageal ulcerations . These overlap findings were not noted during the patient’s prolonged hospitalization, and the correct diagnosis eluded physicians for nearly a month. Delayed or missed diagnoses are common in the practice of medicine. Schiff, et al., reviewed 583 physician-reported errors: 44% occurred during the testing phase and 32% occurred because the clinician failed to consider a compelling alternative diagnosis . The rapid expansion of medical knowledge is a daily challenge for physicians who attend critically ill patients. When the diagnosis is unclear, Tang and Ng demonstrated (in 2006) and Ebell reiterated (2009) the value of using Google as a search engine. Google now indexes the National Library of Medicine and may provide access to older articles released to the public domain [26, 27]. Had the patient’s presenting symptoms and findings (pneumothorax, hydrothorax, shoulder pain, shock) been entered as a Google search, one of the early results was Dr. Anderson’s 1957 article, “Spontaneous Rupture of the Esophagus.”  The results of any search depend upon how the terms are entered or arranged, but esophageal perforation is always noted. The optimal management of esophageal perforation remains controversial. Patient morbidity and mortality depend upon the experience of the managing physicians and institutional clinical resources . In the case presented, failure to consider a rare diagnosis in spite of numerous compelling findings delayed appropriate and timely intervention. One, the diagnosis of esophageal perforation must be considered when a moribund patient presents with a history of chest (or shoulder) pain and is found to have a left hydropneumothorax. Two, community acquired pneumonia does not present with bilateral empyemas and massive pulmonary consolidation from compressive atelectasis. Three, immunosuppression is relative: the differential diagnosis of any pulmonary process in a patient with a connective tissue disorder on low-dose prednisone and methotrexate should include both infectious and non-infectious entities. Lastly, Candida empyema without pneumonia is a well-described complication of esophageal perforation. —(Sir Arthur Conan Doyle in Sherlock Holmes). Griffin SM, Lamb PJ, Shenfine J, Richardson DL, Karat D, Hayes N. Spontaneous rupture of the esophagus Br J Surg 2008; 95: 1115-20. Jougon J, Mc Bride T, Delcambre F, Minniti A, Velly J. Primary esophageal repair for Boerhaave's syndrome whatever the free interval between perforation and treatment Eur J Cardiothorac Surg 2004; 25: 475-9. Fadoo F, Ruiz DE, Dawn SK, Webb WR, Gotway MB, Helical CT. Esophagography for the Evaluation of suspected esophageal perforation or rupture Am J Roentgenol 2004; 182: 117-9. Vogel SB, Rout WR, Martin TD, Abbitt PL. Esophageal perforation in adults aggressive conservative treatment lowers morbidity and mortality Ann Surg 2005; 241: 1016-23. Sahn S. Pleural effusions of extravascular origin Clin Chest Med 2006; 27: 285-308. Bryant R. Salmon C Pleural Empyema Clin Infect Dis 1996; 22: 747-64. The E, Edwards J, Duffy J, Beggs D. Boerhaave's syndrome a review of management and outcome Interact Cardio Vasc Thorac Surg 2007; 6: 640-3. Kiev J, Amendola M, Bouhaidar D, Sandhu BS, Zhao X, Maher J. A management algorithm for esophageal perforation Am J Surg 2007; 194: 103-6. Vallböhmer D, Hölscher AH, Hölscher M, et al. Options in the management of esophageal perforation analysis over a 12-year period Dis Esophagus 2009; 10: 1442-2050.
 de Schipper JP, Pull ter Gunne AF, Oostvogel HJM, van Laarhoven CJHM. Spontaneous rupture of the oesophagus a literature review and treatment algorithm Dig Surg 2009; 26: 1-6. Ramos J, Sadler M. Hydropneumothorax an unusual presentation/complication in community-acquired pneumonia Emerg Radiol 2001; 8: 51-2. Ahmed R, Marrie T, Huang J. Thoracic empyema in patients with community-acquired pneumonia Am J Med 2006; 119: 877-3. Waite S, Jeudy J, White C. Acute lung infections in normal and immunocompromised hosts Radiol Clin N Am 2006; 44: 295-315. Ketai L, Jordan K, Marom E. Imaging Infection Clin Chest Med 2008; 29: 77-105. Janssen N, Karnad D, Guntupalli KK. Rheumatologic diseases in the intensive care unit epidemiology clinical approach management and outcome Crit Care Clin 2002; 18: 729-48. Lisboa T, Blot S, Waterer GW, et al. Radiologic progression of pulmonary infiltrates predicts a worse prognosis in severe community-acquired pneumonia than bacteremia Chest 2009; 135: 165-72. Alarcon G. Infections in systemic connective tissue diseases systemic lupus erythematosus scleroderma, and polymyositis/dermatomyositis Infect Dis Clin N Am 2006; 20: 849-75. Wolfe F. Treatment for rheumatoid arthritis and the risk of hospitalization for pneumonia: associations with prednisone disease-modifying antirheumatic drugs and anti-tumor necrosis factor therapy Arthritis Rheum 2006; 54: 628-34. Sugarbaker D, Lukanich J. Chest wall and pleura: Empyema In: Townsend CM, Jr, Beauchamp RD, Evers BM, Mattox KL, Eds. Townsend: Sabiston textbook of surgery. 18th ed. Philadelphia: Saunders Elsevier 2008; pp. 1668-70. Mandell LA, Wunderink RG, Anzueto A, Bartlett JG, Campbell GD, et al. IDSA/ATS Guidelines for CAP in Adults Clin Infect Dis 2007; 44: S27-72. Septimus EJ. Mandell, Douglas, and Bennett's principles and practice of infectious diseases 17th ed. 2010; 917-24. Kuppusamy MK, Hubka M, Felisky CD, et al. Evolving management strategies in esophageal perforation Surgeons using nonoperative techniques to improve outcomes J Am Coll Surg 2011; 213: 164-72. Richter JE, Friedenberg FK. Gastroesophageal Reflux Disease In: Feldman K, Friedman L, Brandt L, Eds. Sleisenger and Fordtran's gastrointestinal and liver disease. 9th ed. St. Louis:: W.B. Saunders Company 2002; pp. 705-26. Jain R, Thiele D. Gastrointestinal and hepatic manifestations of systemic Diseases In: Feldman K, Friedman L, Brandt L, Eds. Sleisenger and Fordtran's gastrointestinal and liver disease. 9th ed. St. Louis: W.B. Saunders Company 2002; pp. 557-63. Schiff GD, Hasan O, Kim S, et al. Diagnostic error in medicine: analysis of 583 physician-reported errors Arch Intern Med 2009; 169: 1881-7. Tang H, Ng JH. Googling for a diagnosis—use of Google as a diagnostic aid internet based study BMJ 2006; 333: 1143-5. Ebell M. How to find answers to clinical questions Am Fam Physician 2009; 79(4 ): 293-6. Anderson RL. Spontaneous Rupture of the Esophagus Am J Surg 1957; 93(2 ): 282-90.